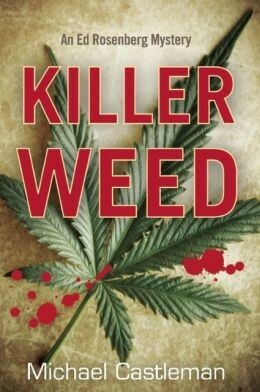 Bestselling author Michael Castleman - a Bay Area resident since 1975 - released a new murder mystery this week titled Killer Weed, and he's signing copies next Wednesday at the Diesel book store in Oakland. "Killer Weed hooked me on page one and I savored the references to San Francisco in the 1960s. A fascinating story with a strong ending,” stated Grace Slick, vocalist for Jefferson Airplane and Jefferson Starship. The book came out earlier on September 9 and "is a fast-paced magical mystery tour through a marriage under duress, forty years of pot dealing in America, and two murders, one contemporary, the other a cold case from 1968,” according to publicity materials. “As the novel opens, bankruptcy threatens historian-turned-journalist Ed Rosenberg and his wife, Julie. Victims of newspapers’ decline, they’ve just been fired from the San Francisco Foghorn (a thinly veiled Chronicle). Scrambling for work, Ed lands a gig researching the hippie Haight-Ashbury for a museum exhibit sponsored by a tech billionaire whose birth mother was a small-time marijuana dealer shot to death in Golden Gate Park in 1968. "Meanwhile, Julie is hired to be the media liaison for mayoral candidate Dave Kirsch, a former pot dealer and author of best-selling guides to growing weed. Then Kirsch is murdered. His death costs Julie her job and returns the couple to the brink of financial ruin. Ed’s research about the hippie Haight’s tie-dyed past illuminates that era vividly—and along the way explains fascinating trivia, for example, the derivation of the term 'psychedelic,' and how the Grateful Dead and Jefferson Airplane got their names. It also introduces Ed to a rogue’s gallery of characters who, he realizes, may have been involved in the contemporary murder. Then someone starts shooting at him. “San Francisco—both then and now— comes alive. In addition, Killer Weed features sympathetic characters, and a compelling, nuanced portrait of a marriage under duress. Struggling to make ends meet, Ed and Julie feel seriously stressed—and they both use drugs to cope. He smokes more weed, which she doesn't like, and she drinks more alcohol, which he can't stand. Killer Weed is a murder mystery, but it’s much more than a whodunit. It’s the only book, nonfiction or fiction, that recounts the real forty-year history of marijuana dealing in America—starting with importation from Mexico, then proceeding to midnight rendezvous with Colombian freighters on the high seas, followed by outdoor growing in remote national forests, and finally to indoor growing under solar-powered lights. Castleman’s portrait of the business side of weed is detailed and authoritative." Castleman grew up in Lynbrook, Long Island and graduated from the University of Michigan with a degree in English in 1972, then earned a Masters in journalism from UC Berkeley in '77. An award-winning medical journalist, he is the author of twelve consumer health and sexuality books and currently publishes GreatSexafter40.com. He has published three previous Ed Rosenberg novels: The Lost Gold of San Francisco, Death Caps, and A Killing in Real Estate. - Wednesday, September 18, 7 p.m. Diesel, A Book Store, 5433 College Ave.
Killer Weed - Murders, Mystery & Marijuana! from Michael Castleman on Vimeo.